Out of curiosity, does Edge have a noticeable benchmark disparity with IE 11, too, using your same benchmarks? 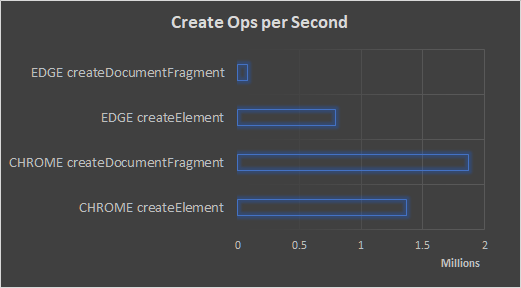 Interesting question - createDocumentFragment in IE11 is about the same, but createElement is considerably slower in ie11 (around 70k operations per second, so an order of magnitude slower than Edge). What about Firefox? Recent versions are comparable to Chrome or better in most performance aspects. I switch to firefox, their last release is supper fast. Also their newer release allows to view pages side-by-side a feature they call open-side-view.